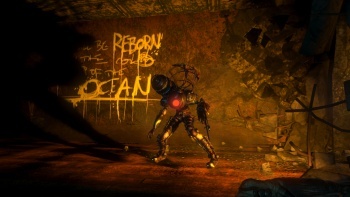 2K Games has announced more downloadable content for BioShock 2, this time for the single player game. If you enjoyed guarding the Little Sisters while they harvested Adam in BioShock 2, then you're probably going to like the new single player DLC, Protector's Trials. The new pack lets you once again take on the role of a Big Daddy and defend a Little Sister against packs of Splicers across six new maps based on locations from the main game. 2K president Christoph Hartmann said that 2K Marin has been working on expanding the single player content since the game had launched, and that Protector's Trials would be some of the most challenging gameplay in the BioShock series to date. He also said that fans should expect more single player DLC in the future: "This is just the beginning," he said. More single player content is on the way that will deliver more of the intense action and story-driven gameplay that fans have been craving." While there are those who didn't enjoy the Adam harvesting sections of BioShock 2, making it its own thing seperate from the narrative sounds like it could be a lot of fun. Protector's Trials is due to be released for PC, PS3 and Xbox 360 on August 3rd. It will cost 400 Microsoft points, or $4.99, and has seven new achievements/trophies.